As a student at the Institute for Public Administration (the Ford School) in the early 1960s, Ford School Committee Member David P. Fauri (AB ’62, MPA ’64) doubled up on internships in Ann Arbor, MI and Baltimore, MD. As a student at Princeton’s Woodrow Wilson School—during the height of the Vietnam War—Ford School Committee Member Martha Darling conducted field research for the American Ambassador to Thailand, who had been charged with developing counterinsurgency policy. And Gilbert Omenn, Darling’s husband, spent one summer doing ocean sampling and Triassic shale studies for the Woods Hole Oceanographic Institution and another serving as a fellow at the Weizmann Institute of Science, based in Rehovot, Israel. Those summer experiences were transformative, and have never been forgotten. They launched careers. They encouraged service. They led to lifelong friendships. And more recently, they have inspired endowed gifts that will support Ford School internships far into the future. Fauri’s second internship focused on national policy. He worked in the U.S. Social Security Administration’s Division of Program Evaluation and Planning at a time when administrative leaders were working on the original Medicare and Medicaid legislation. “The social security office was located in Baltimore, and key administrators would travel to the Capitol for the [legislative] hearings,” says Fauri. When they returned from those hearings, they would debrief with staff and interns. For Fauri, the experience is still close and memorable. The new gift from Martha Darling and Gilbert Omenn will establish a permanent endowment for Ford School graduate student internships in health, science, and technology. Darling and Omenn have been supporting internships for years through expendable contributions to the school. Beneficiaries of those gifts include Ruth McDonald (MPP ’15), who interned with the U.S. Department of Health and Human Services in Washington, DC; Kiana Shelton (MPP ’16) and Demar Lewis (MPP ’16), who interned with Ford School alumna Ruth Browne (MPP/MPH ‘83) at the Arthur Ashe Institute for Urban Health in Brooklyn, NY; Mohammed-Ali Abazeed, who interned with the city health department in Detroit, MI; and many others. Each of these newly endowed funds, carefully managed for growth by the University of Michigan, will provide annual support for Ford School students taking unpaid or low-paid internships with public sector organizations. Over time, the funds are expected to grow, allowing larger stipends to keep pace with inflation and to increase the number of beneficiaries when resources allow. In addition to these outright gifts, Ford School Committee Member Michael Staebler (JD ’69) has pledged an estate gift that will also provide internship stipends. In 1991, when the Ford School Committee was established, Staebler served as founding chair. The Neil Staebler Political Education Fund was established in his father’s honor that year—and Mike’s gift will significantly increase the fund’s value. Neil Staebler (AB ’26) was a University of Michigan alumnus and one of the state’s leading political activists. Since 1991, dozens of friends, family members, and colleagues have made contributions to the fund (those contributions total $258,000). Through careful stewardship by the University of Michigan's endowment managers, the fund has grown in value to $629,000 over the past 25 years, while supporting dozens of Ford School student internships, including nine just this summer, as well as a variety of programs. Alumnus David P. Fauri earned his master’s of public administration from the Institute for Public Administration, predecessor to the Ford School, in 1964. He went on to earn a doctorate in public administration from the Maxwell School at Syracuse University and to become a professor of social work at Virginia Commonwealth University in Richmond. The first Fauri interns will be selected next summer. 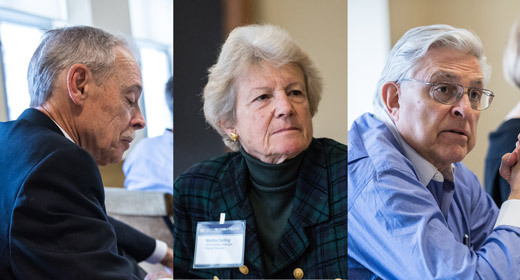 Martha Darling and her husband, Dr. Gilbert Omenn, have supported a number of health policy initiatives, outreach activities, and internships at the Ford School. Darling served as senior legislative assistant to U.S. Senator Bill Bradley and as a White House Fellow in the Department of Treasury. Omenn is former executive vice president for medical affairs and chief executive officer of the University of Michigan Health System. He served as a White House Fellow in the Atomic Energy Commission (during the Nixon/Ford era) and as deputy science advisor to President Carter and associate director of the Office of Management and Budget. University of Michigan alumnus Michael Staebler is founding chair of the Ford School Committee, which was established in 1991 to promote and increase private support for the Ford School’s students, research, and policy engagement. This fall, he announced his retirement from Pepper Hamilton LLP, where he has long served as a senior managing partner.